I have been eliminating meat and reducing many animal based products for a while, so I couldn’t wait to get my hands on “Vegan Everyday: 500 Delicious Recipes” by Douglas McNish! I normally go into trying recipes directly when reviewing a cookbook, but as I browsed this one, I discovered an awesome source of basic vegan cooking knowledge at the beginning, so I took the time to read through it before picking recipes to try. I recommend readers to do the same. I think that the wonderful experience I had cooking from this book had much to do with the added knowledge I acquired by reading and familiarizing myself with different ingredients and recipes. It definitely made it easier for me, being an old traditional Italian cook. I tried a few different recipes to get a feel of the entire book. The first one I did was the Roasted Garlic and Parsley Sunflower Seed Butter. It was not only easy…it was delicious on gluten free toasts. I even used it to make gluten free garlic bread. This one I followed instructions to the tee because I has never made butter before, however, I did get creative with some of the other recipes by substituting or even eliminating some ingredients. Such as with the Cheesy Broccoli Quinoa Soup by eliminating the nutritional yeast (which I am not a fan of) and by cooking the quinoa separately for a while and then adding to the soup to finish it off (by doing this I made sure the soup didn’t burn in the bottom of the pan while the quinoa cooked). 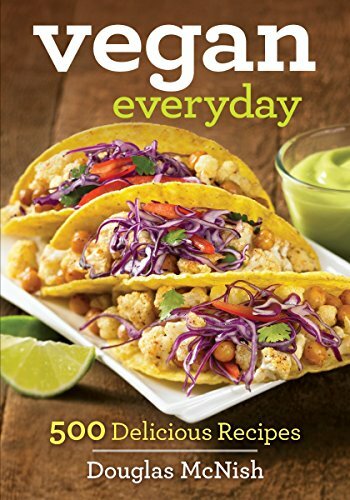 Some of my favorite recipes in McNish’s “Vegan Everyday” are the Roasted Cauliflower and Chickpea Tacos, Mushroom Risotto Cakes, Fudge Bites, and the old mighty Churros with Cinnamon Sugar! Yet, the best part of the book I would say is the Gluten Free Pantry and the Vegan Basics sections; as well as the number of different Ice Creams recipes (which I didn’t try as I don’t have an ice cream maker, but will get one before the summer is over…). The only thing I was not a fan of in the book was the amount of recipes that included the nutritional yeast, many of which I did not see the purpose of; but this could be the Old Italian simple ingredients recipes cook talking! Overall, I loved “Vegan Everyday: 500 Delicious Recipes” by Douglas McNish, not only as a step by step recipe guide but also as an inspiration source to be creative and play with the recipes. I definitely recommend to vegans and regular eaters who just want to add more veggies into their diet!